May I recommend one of my candidates for the Ten Greatest Movies list—The Winslow Boy? What the 1948 British film (not David Mamet’s 1999 remake) has going for it is a brilliant director, Anthony Asquith—who ranks with such luminaries as Carol Reed, Alfred Hitchcock, John Huston, or Jean Renoir—and a stellar cast, which includes some of the most skilled actors in movie history, from Cedric Hardwicke on down, all at the top of their form. But above all these advantages, the movie’s animating spirit is its script, by Terrance Rattigan and Anatole de Grunwald from Rattigan’s play, which grippingly dramatizes a principle at the very heart of Anglo-Saxon liberty—a principle that today’s America badly needs to relearn. The story, set in 1912—when director Asquith’s father, H. H. Asquith, was Britain’s Liberal prime minister, and World War I was brewing—is simple, and it won’t spoil the movie for you if I sketch its outline. Twelve-year-old Ronnie Winslow gets expelled from Osborne, the prestigious boarding school for cadets headed for Royal Navy commissions, for allegedly stealing five shillings. Though the sum is trivial, the alleged breach of the code of officers and gentlemen is not. 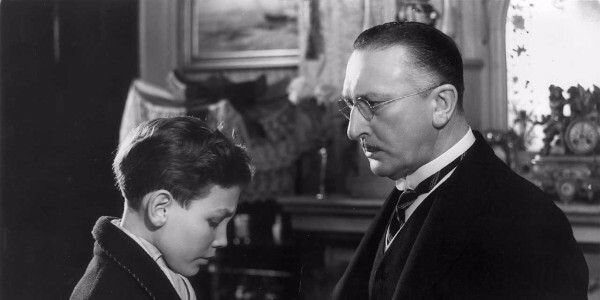 His father, Arthur, a newly retired Wimbledon bank manager played by Hardwicke, solemnly asks him if he is guilty—twice—and when the boy twice asserts his innocence, his father, who raised him to tell the truth, vows to vindicate the boy’s honor, whatever the cost.It proves immense. In his quest, which lasts until after Ronnie turns 14, Arthur sacrifices his health, much of his savings, and the happiness and future of his solidly respectable and eminently likable upper-middle-class family. He meets obstacles at every point. The school’s commandant tells him that, as he had no doubt of Ronnie’s guilt after hearing the details of the theft, he has no second thoughts about summarily expelling the boy, without any formal procedure or even someone to advise Ronnie or speak in his defense. He won’t reconsider the evidence or say what it was. A visit to the Admiralty Commission to threaten a lawsuit gains Arthur only a haughty declaration that he needn’t bother: a subject of the king can’t sue the king’s representatives, for the law holds that the king can do no wrong. True enough, his solicitor tells him; but nevertheless Magna Carta, the thirteenth-century charter of English liberties, declares that “no subject of the King may be condemned without a trial,” so perhaps Arthur should ask his MP to denounce the wrong done to Ronnie in Parliament. Good advice: for the MP, seeing a chance to win favorable press as a defender of justice, is glad to oblige. Reporters readily take the bait and make the Winslow case a national cause célèbre. The uproar catches the interest of Sir Robert Morton, England’s most eminent—and expensive—barrister, masterfully played by Robert Donat as a complex mix of eloquence, cold hauteur, ruthless intelligence, and deep but hidden feeling, a legal version of Jane Eyre’s Mr. Rochester. Morton drops in at the Winslows’ house on his way to dinner with a duchess, politely introduces himself, and mercilessly cross-examines Ronnie, until the boy stammers with confusion and his family (along with the audience) wonders if he’s been telling the truth. But after such browbeating, the great man abruptly announces that he’ll take the case, for he thinks Ronnie is innocent. “I like that phrase, sir,” says Arthur. “It has a certain ring to it, hasn’t it?” Morton replies. Here the movie sounds the deepest chord of English jurisprudence, for Morton is paraphrasing England’s first prime minister, William Pitt the elder, who was himself echoing the great Jacobean chief justice, Lord Coke: “The poorest man in his cottage may bid defiance to all the forces of the Crown,” Pitt had declared. “It may be frail, its roof may shake; the wind may blow through it; the storm may enter, the rain may enter—but the King of England cannot enter; all his force dares not cross the threshold of the ruined tenement.” No wonder the whole House of Commons rises to Morton’s words like Pavlov’s dog and exacts the First Lord’s promise to advise the Attorney General to accept Winslow’s petition and let the case come to court. As it does; and of course Morton is magnificent, demolishing the Osborne commandant and his witnesses, and leaving the Attorney General, representing the Crown, only to declare that he accepts that Ronnie is completely innocent, as Morton, his wig askew, weeps from relief at having vindicated right. What has a 1948 movie about England in 1912 to do with America a century and more later? Only this: the arbitrary power that the film condemns—and that President Woodrow Wilson injected into the American polity after his election in 1912—has been steadily eroding the rights and liberties of Americans ever since. Even before the Declaration of Independence, with its assertion of our unalienable, God-given right to liberty—even before the Constitution, with its limited government of enumerated powers and checks and balances to guard against the arbitrary power the Framers feared—colonial America’s settlers believed themselves shielded by the rights and liberties that Magna Carta guaranteed free-born Englishmen, especially the right not to be deprived of life, liberty, or property except by due process of law. Many American Revolutionary soldiers believed that they were fighting to defend these historically-rooted liberties as much as the abstract ones that Jefferson enunciated. But Wilson’s progressivism, followed by the New Deal, the Warren Court, and Barack Obama’s pen-and-phone rule by decree, steadily subverted all that. Wilson and FDR had no use for the Founders or their limited government or their antiquated, slow-moving, inefficient system of checks and balances. Fast-changing modern conditions, they asserted, required efficient rule by disinterested experts—unelected economists, engineers, social scientists, and the like—working in such executive-branch agencies as the Interstate Commerce Commission or the National Labor Relations Board, and promulgating rules, enforcing them, adjudicating infractions of them, and exacting punishments without even the pretense of due process. No more separation of powers: these executive-branch agencies would in effect legislate and judge as well, with a benign Supreme Court sitting as a permanent Constitutional Convention and making up justifications for such unconstitutional, undemocratic rule as it went along. The right of a puny individual farmer to grow what crops he wants for his own use in what quantity he thinks best must give way to the diktat of a government expert who understands the part these few puny acres play in the overall national economy. The right of a purely local manufacturer to follow the labor laws of his own state must give way to federal regulation, for even the most local business is part of the total U.S. economy. The right of a puny college student charged with sexual harassment to due process, including legal representation, the right to confront his accuser, and the right to be presumed innocent until proved guilty beyond a reasonable doubt must give way to the “advice” of some Department of Education commissar on how to protect women students at whatever cost. You can imagine what might happen to a latter day Ronnie Winslow. After 100 years of creeping tyranny—by degrees, by the slow poison of indifference, by being convenient—no wonder Americans are thirsting to have their constitutional rights and liberties back. It’s time, they feel, to let right be done again. This entry was posted in Articles, Publications and tagged Administrative state, Declaration of Independence, Franklin D. Roosevelt, New Deal, Supreme Court, Thomas Jefferson, U.S. Constitution, Woodrow Wilson. Bookmark the permalink.